Apologies for the slightly clickbait-type title. I will not be making the Winnipeg Jets goaltending woes disappear. However, I will be taking an in-depth look at the Jets and their netminding. I will weigh the options and then make suggestions on what the Jets could do with some pros and cons to each option. If you already understand why we use save percentage, or save percentage variants, then you may not need to read this section. There are two reasons why we care so much about a goaltender’s save percentage. For starters, it is the bulk of a goaltender’s impact on wins. The higher percentage of shots a goaltender stops, the more likely their team wins a game. Alternatively this also means that the less impact a goaltender has over their own save percentage, the smaller impact they have over the game, and matter less as a position. Secondly, past save percentage performance becomes predictive of future save percentage performance as samples become sufficiently large. This suggests goaltenders do maintain a significant control over their save percentage at those samples. Combine these two factors and this means save percentage is a decent proxy of a player’s true-talent level and can give a guideline of what we expect. Of course, the caveat of all statistics is sample size. You need sufficient sample size so the signal washes out the noise, and save percentage has a lot more noise than most hockey statistics. In fact, we expect a replacement level goaltender to outperform a bonafide All-Star once every six times, in a 15 game set. The industry standard is usually the last 3000-5000 shots for netminders, although there is no magic line. The larger you expand the sample, the more confident you are the statistic is a decent proxy of a netminder’s true-talent. The opposite is then true with shrinking a sample. For example, Ondrej Pavelec’s first and final 3000 shots as a Jet were 0.906 and 0.907 in save percentage. How Do You Rank the Goalies? The second table is simply the first table but relative to Pave’ec’s numbers. This post was originally scheduled for Saturday and Hutchinson has since played one game where he did do well, pulling these numbers up by the final digit. The Jets have three goaltenders with NHL experience and here are their career numbers. We see here that Connor Hellebuyck has the best performance in all four measures. This suggests that Hellebuyck is most likely the best true-talent of the three. It also suggests, if we somehow had nearly unlimited parallel universes where one goalie played the remainder the season, that Hellebuyck would have the best performance more often than the other two. Not every time, but more often. However, at 1500 shots, we aren’t overly confident at the specifics yet. Hellebuyck’s numbers are not defining of him. He could be better and he could be worse than his current numbers. Both are viable possibilities. His pedigree and previous history suggests he is better, but these are very light suggestions. 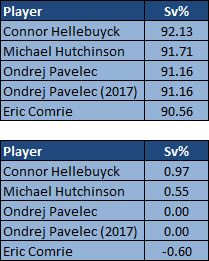 Comparing Michael Hutchinson and Pavelec gets a lot murkier. We see here that Pavelec has been superior in 5v5 situations, but Hutchinson has been the better goalie when including all situations. There are pros and cons to each measure. All mins increases the sample but increases the variance in environments. Which one is superior can depend on the sample size. I’d essentially call it a tie. Even if we look further back, Hutchinson has a better history of performance in the AHL but Pavelec had the better junior performance. At 2400 shots, there is still a chance Hutchinson could budge a bit higher or lower, but we are starting to know who Hutchinson truly is. Please note that the data is one game old. For example Hutchinson All Mins Sv% is now 0.8956. Things have been bad… but they have also been worse. Despite all the anger and disappointment, Hellebuyck’s bad slump this season has essentially been the same as what the Jets got on average from Pavelec for five seasons. He’s had highs and lows but the average is exactly what the Jets typically saw previously. 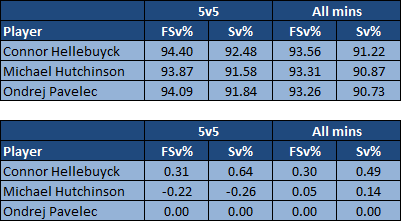 However, unlike Pavelec, Hellebuyck typically has been better previously. That puts some interesting perspective upon things. Hutchinson though has been truly terrible. The question though I wanted to find the answer to is: how often have the Jets seen this type of performance before from Pavelec? This is almost, but not quite, the worst we’ve ever seen from Hutchinson. 94% of Hutchinson’s career has been better than his 18 game streak. He has been worse though, with an 18 game low of 0.8879. A slight aside, I previously on Twitter looked at Pavelec’s rolling 59 game save percentage versus Hellebuyck’s career numbers. Once Pavelec put up a <0.903 5v5 save percentage performance over a fifty-nine game span. That’s about what Hutchinson has been on 5v5 in that poor 18 game stretch!! Now that’s the worst low for the Jets 2.0 franchise!! So should we call up Pavelec? AHL career performance. Again, reminder that the data is as of last Saturday. I’m going to cop out and say it depends. As we just showed, it is unlikely that Pavelec called up out performs Hellebuyck. In fact, it is most likely that he is better than Hutchinson has been this season, but Hutchinson is nearly equally, if not more, likely to be better for the remainder of the season also. Now for the reasons for and against calling up Pavelec beyond expected performance. Earlier I suggested the Jets sending down Pavelec despite the fact that Hutchinson could be fairly comparable in performance. There was still unknowns with Hutchinson that needed more playing time to figure out. While this is still true to some degree, it is even less so now. In addition, the Jets needed to make sure that they did not lose Hutchinson to waivers, as they must expose one goalie in the expansion draft. Obviously the Jets hope to protect Hellebuyck and Pavelec turns into a unrestricted free agent so he will not count. It is a lot less likely Hutchinson gets picked up in waivers now than at the start of the season. Other than that, I do not see much reason for change unless one of Hutchinson or Hellebuyck start performing worse than we’ve ever seen from Pavelec. I understand how people want change. Change for the sake of change is understandable, although not always the best way to get the desired results if it hurts your probability in receiving the desired results. Of course, there are some that think Pavelec has been proving himself in the AHL. I should point out that Pavelec this season has not been much different than he historically performs in the AHL (he has since had one game, improving his 2017 numbers). His performance still pales in comparison to Hutchinson or Hellebuyck accomplished prior to their being called up. Again, I suggest that there is no real reason to call up Pavelec unless he starts performing in a manner not seen previously by Hutchinson or Hellebuyck. I personally don’t believe in the status quo being kept. There are issues and things that need to be addressed. Some have suggested a coaching change, while just a change in coaching approach could be all that is needed. While I used to be both a goalie or a goalie coach, I know my expertise falls in analyzing data, not analyzing goalie technique or coaches. I can fix Hellebuyck. It’s really not that bad. There is another option. The Jets could look to the Islanders for a Pavelec-Halak swap. Halak only has one year, can be exposed in the expansion draft, and typically is a better performer than Pavelec or Hutchinson. You kind of have a big typo in your title. You’re missing the second “r” and “i” in repairing, unless I’m missing something. Why oh why didn’t we pick up Halak? I was in Montreal for the Price/Halak debate. I was firmly on the keep Price side, but Halak was (still is) a pretty damn good goalie. Perfect veteran presence for Helle imho.